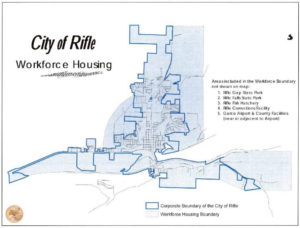 In spring 2008, the City of Rifle passed an ordinance adopting a Workforce Housing Pilot Program. 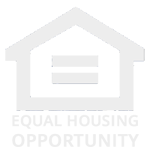 Under this program, a qualified applicant receives certain fee waivers for building residential housing targeting families earning 115% or less of the household Area median income for Garfield County. The GCHA administers Rifle’s Pilot Workforce Housing Program. All units sold under this program are deed restricted for at least ten (10) years with an annual appreciation cap of 3 percent or the Consumer Price Index (CPI), whichever is greater. All homes must be owner-occupied. Purchasers of Workforce Housing Units must comply with the City’s Ordinance. At least one member of the household must be an eligible purchaser defined as any person who is a full time resident employee, employed within the corporate boundaries of the City of Rifle, or who is employed in a position with a school district, state, federal or county government at a location within approximately 15 miles of the corporate boundaries of the City. A map is available at the City or the GCHA depicting the Workforce Housing eligibility area. The area includes Rifle Gap State Park, Rifle Falls State Park, Rifle Fish Hatchery, Rifle Corrections Facility and the Garfield County Airport and County Facilities. A person who has been recruited to work for a City based employment source or other sourced described above must produce evidence of the offer of employment. Full time employment is defined as working at least thirty-two (32) hours per week. Purchaser(s) must occupy the unit at least nine (9) months per year. 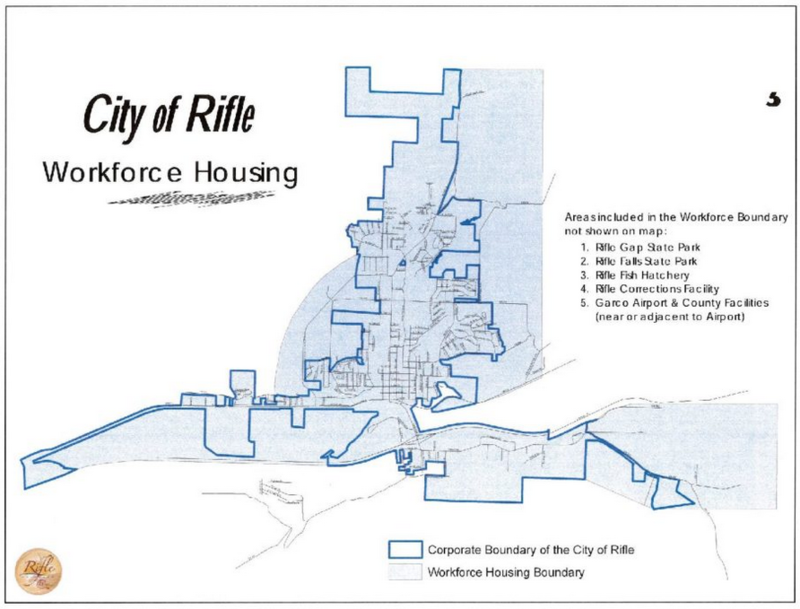 The City of Rifle has six deed restricted properties consisting of three single family homes and a triplex. All are three bedrooms with 2 baths.